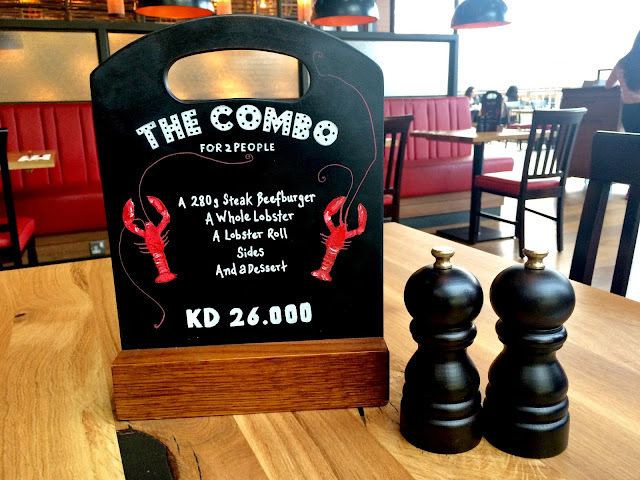 Burger & Lobster opened its doors in Kuwait in November last year. 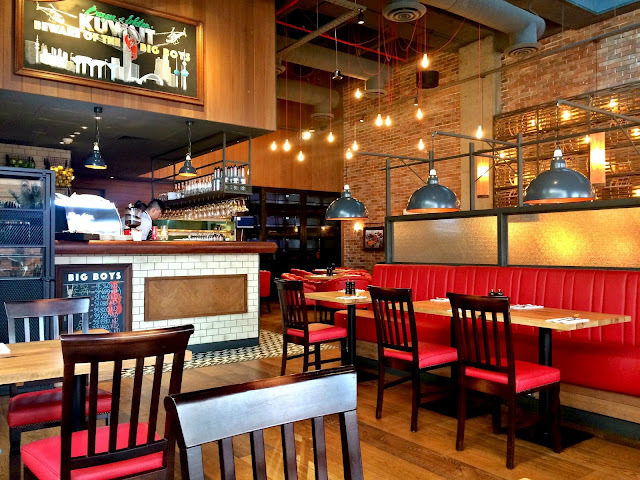 Don't you just love how a lot of restaurants choose tiny Kuwait as their first (or second) International destination? Kuwait is well on its way to becoming the World's Food Capital and all I can say is lucky me! 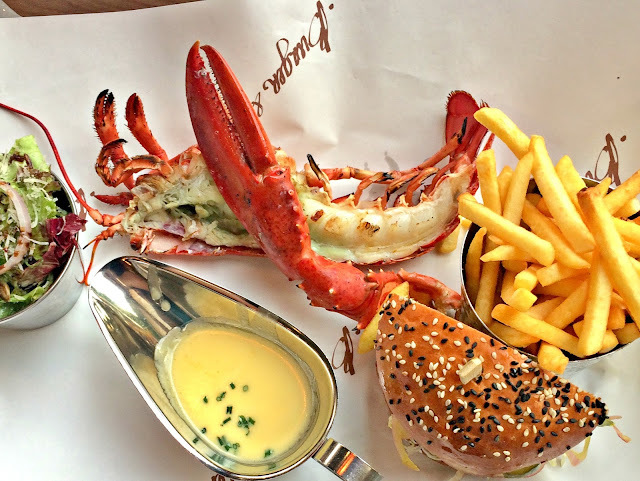 I'd been wanting to try out Burger & Lobster for a few good months now and their instagram is full of mouth-watering photos to tempt you if you weren't already. The restaurant is unique in the sense that they just has 3 mains displayed on a black board, a burger, a lobster roll and a whole lobster each selling for KD 8.95 each. Fuss free right? 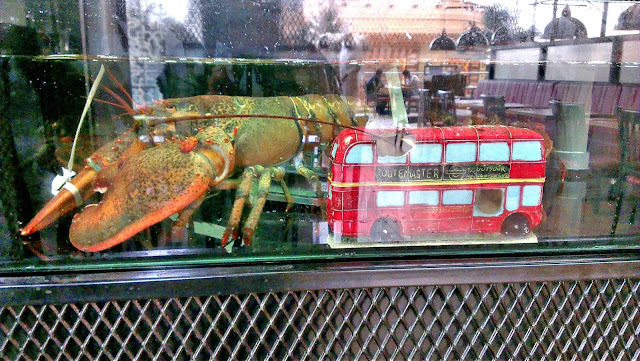 There's also the option of ordering one of the "big boys" (above photo) for large parties where you pay for these enormous lobsters by the kilo along with which you also get unlimited fries and drinks. 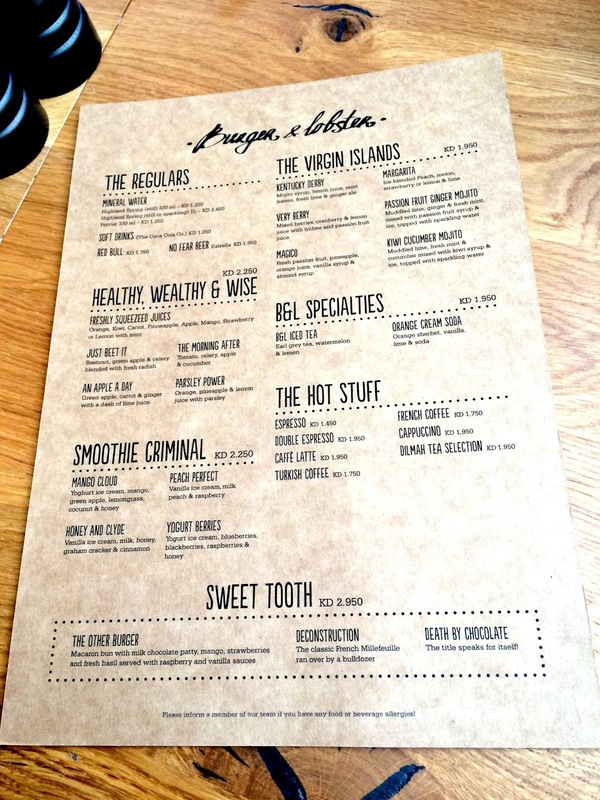 The restaurant also has a selection of drinks and desserts which are printed on a basic menu card. The mains are each priced at $20 in the US and £20 in the UK and I remember there being speculation about how the prices might be KD 20 in Kuwait. 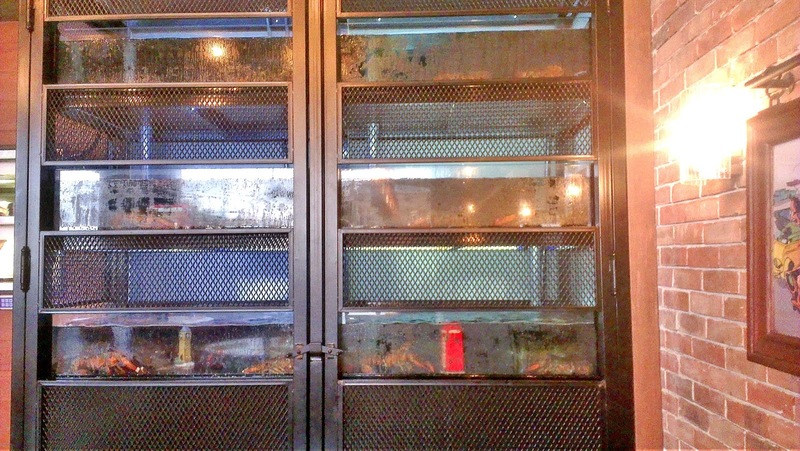 Thank goodness someone had the sense to price the dishes similar to the UK, however I think almost KD 9 for a burger is a bit insane, no matter how good it is. Since it was our first visit to the restaurant, our server recommended that we take the combo, which is all 3 dishes plus a dessert of your choice for KD 26.000. That's definitely the best way to taste everything the restaurant has to offer. 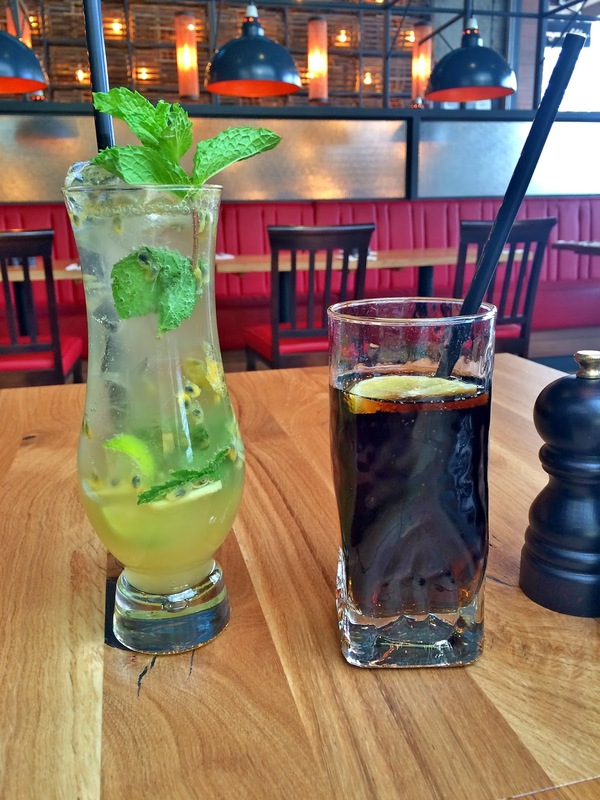 For drinks, my eye immediately fell on the Passion Fruit Ginger Mojito (KD 1.950) which contains lime, ginger, mint and of course passion fruit. Such a fresh and delicious combination of ingredients which I absolutely loved. We also ordered a coke, pretty standard. While we were waiting for our mains to arrive, our server gave us each a plastic bib and a few tools of the trade, namely a lobster cracker and a fork pick. 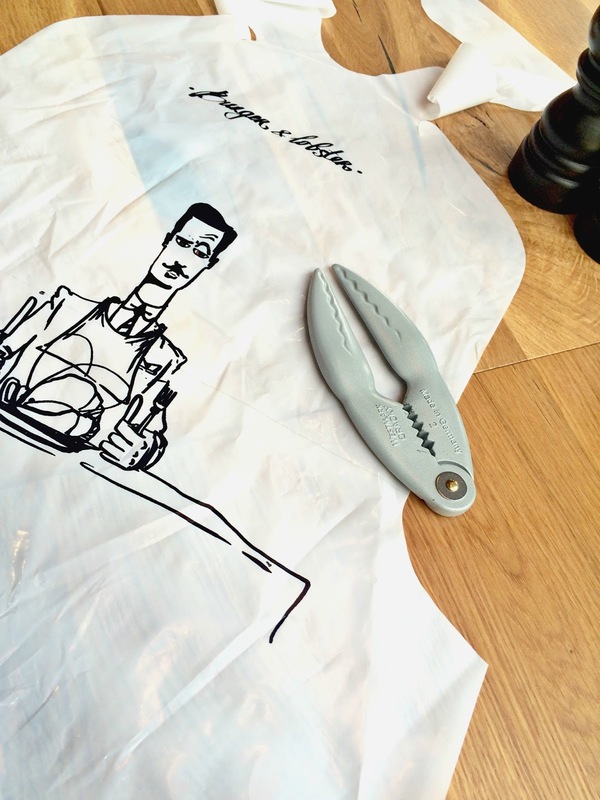 I put the bib aside thinking I wouldn't need it, but being as clumsy as I am, changed my mind and adorned it to protect my top. ﻿The whole lobster could be either grilled or steamed and we decided to have it grilled for that great smokey flavour. It was served with a small pitcher of rich, creamy lemon and herb butter sauce which I just couldn't get enough of. I doused my entire lobster in it and demolished it within a few minutes. Now, I've only had lobster twice before in my life and both times, it was a bit meh. That sauce was just delicious though, totally transformed my opinion of lobster and I now get the whole hype around it! I'm sure I was an awkward sight attacking the lobster with the cracker and all I have to say is thank goodness for that bib! ﻿Now, that burger is a beast of a thing and I couldn't finish it. After taking a few bites, I had to ask for it to be doggy bagged because it was that big! The burger will be cooked to whatever temperature you require and we asked it to be cooked to a medium well done as there's really no other way to have it. It was juicy and was served on a perfectly toasted sesame bun with the works. Definitely one of the best burgers I've had to date, though I'm not sure if I can justify its rather high price tag, especially if bought on its own and not part of the combo. 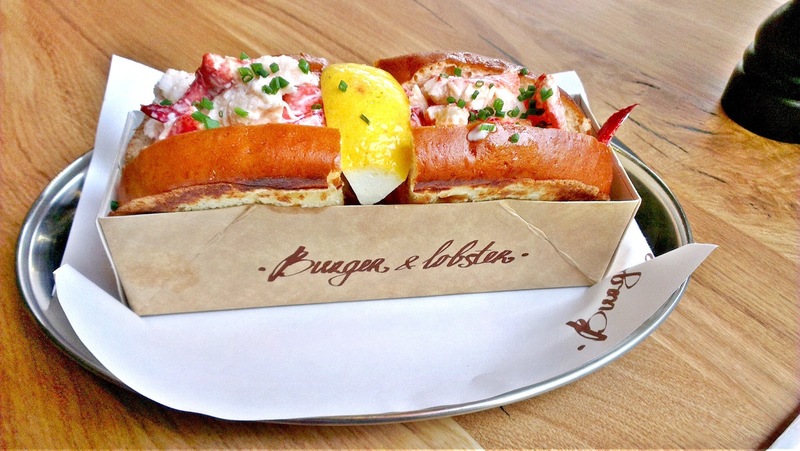 We saved the best for last and moved onto the lobster roll next. Its a cold dish served on a generously buttered and toasted brioche bread. As I was about to take a bite, the manager approached our table and told us that he loves to have the roll with the butter sauce and quickly went to refill our pitchers. There's something about the combination of the cold Japanese mayo coated lobster meat and hot buttery sauce, it was to die for and though quite a rich dish, I polished it off in no time! The combo was served with a side of fries and a small dressed salad, both excellent and perfect additions to the meal. For dessert, we had a choice of three very interesting and creative dishes, all priced at KD 2.950 each. We almost went with The Other Burger, which is a supposed to be a dessert disguised as a burger with a macaron (the bun), a milk chocolate patty with mango, strawberries and basil (the toppings). Its served with raspberry and vanilla sauces, which I assume to be your mayo and ketchup. While placing our order though, the restaurant manager quickly ran each of the desserts by us and mentioned that the Death by Chocolate was their best seller and with his description of the dish, we just had to try it. It truly was "death by chocolate" and was a magical end to our meal. 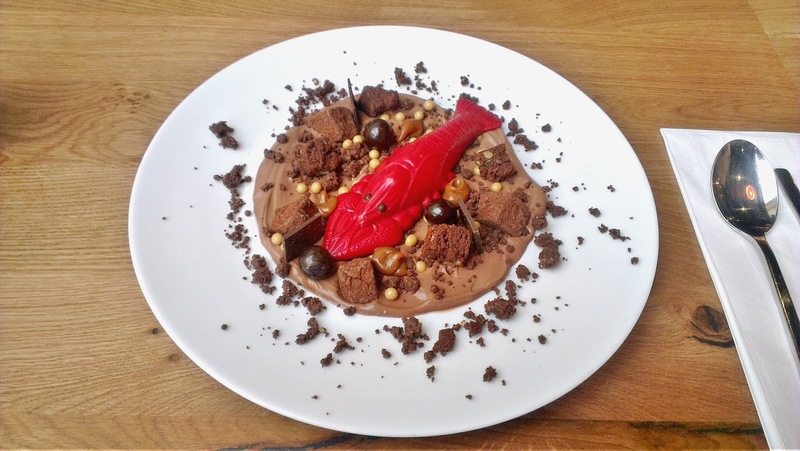 The dish contains a light and creamy chocolate sauce crowned with brownie bites, mounds of caramel and a sprinkling of chocolate balls all topped with a chocolate lobster filled with that heavenly caramel. As it was a beautiful mix of both milk and dark chocolate combined with that caramel, you aren't overwhelmed with the sweetness of the dish and we just stopped short of licking the plate clean! We loved every single dish we tried and left feeling happy and content! Definitely a great restaurant to try. 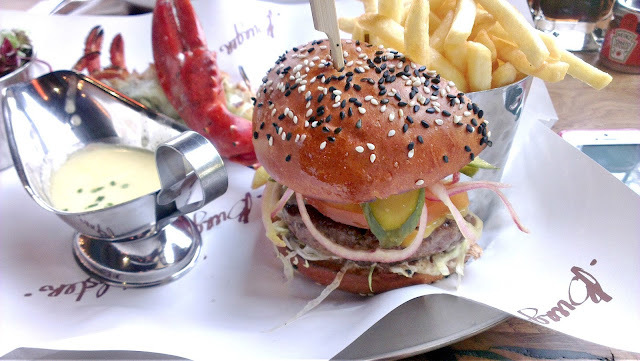 Burger & Lobster is located right next to Figs in the Galleria overlooking The Cheesecake Factory in the Grand Avenues, The Avenues Mall and you can check out their instagram and facebook here. Haha, I know exactly what you mean! If crab and prawns are served in the shell I get a little freaked out, especially if the head and eyes in particular are still there. But for some reason, I wasn't so fazed with the lobster and really enjoyed it. I think my empty stomach had a little something to do with it!